A primary focus of California Department of Fish and Wildlife’s Marine Wildlife Veterinary Care and Research Center (CDFW-MWVCRC) is providing pathology and laboratory diagnostic investigation services for sea otter mortalities and other marine wildlife mortality events, and archiving of tissues and specimens. This research provides information to the Office of Spill Prevention and Response (OSPR), CDFW, and other agencies on factors limiting the recovery of the southern sea otter population, and information on background mortality rates of otters and other marine wildlife (useful for detecting unusual mortality events). The U.S. Fish & Wildlife Service (USFWS) Recovery Plan for the Southern Sea Otter identifies the CDFW as the lead agency for investigation of mortality. Today, the majority of all southern sea otters found dead off the coast of California are brought to the MWVCRC in Santa Cruz for necropsy or are examined in the field by CDFW sea otter biologists. The MWVCRC has a dedicated necropsy laboratory for post-mortem examinations of sea otters and other marine wildlife. For more information on what we’ve learned by investigating sea otter pathology, check out MWVCRC’s Technical Reports and Publications pages. 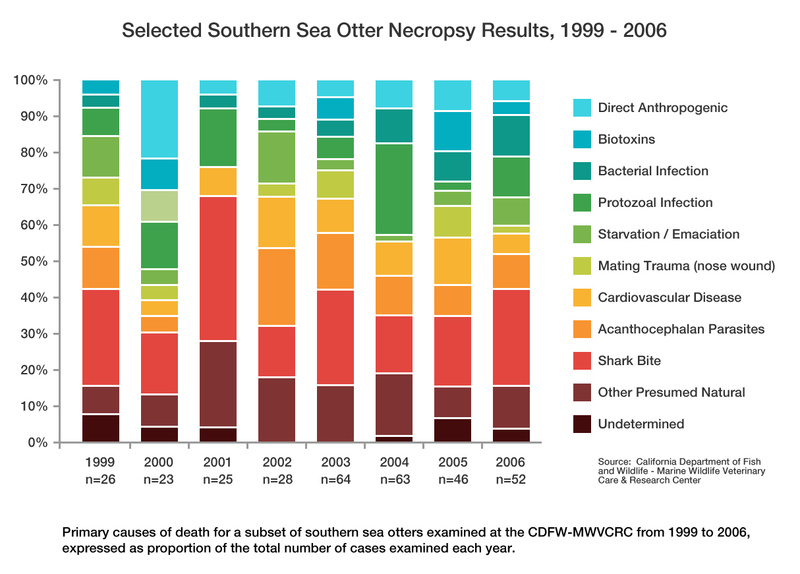 The graphic below provides a summary of primary cause of death for a subset of sea otters examined at the CDFW-MWVCRC from 1999 through 2006, including only fresh carcasses of subadult or adult animals. Although these animals represent a small fraction of the total number of sea otters that die in California each year, this mortality information provides an approximation of the range and relative proportion of factors responsible for mortality during this time period. What are Sea Otter Necropsies and Why are They Needed?